Two years ago, three University of Mississippi faculty members became aware of efforts by several Marks residents to improve living conditions in their community. With a commitment to support these endeavors, the trio began recruiting undergraduate students to assist them. 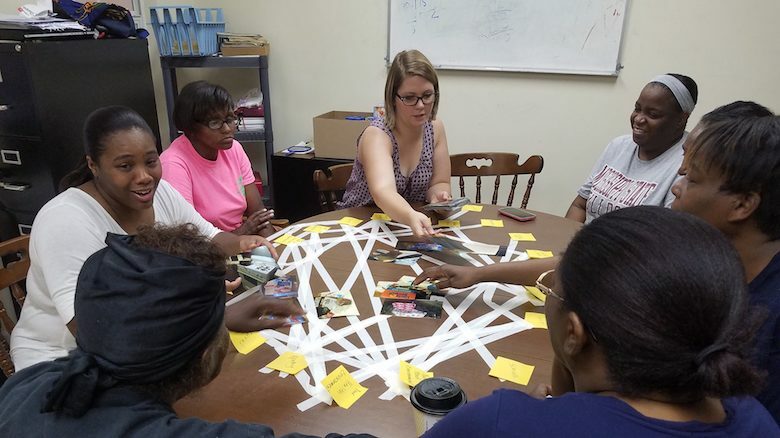 Recently, the faculty members and five UM undergraduate students conducted a summer study of community renovation in the Mississippi Delta. Anne Cafer, assistant professor of sociology and coordinator of the Community Based Research Collaborative via UM’s Center for Population Studies; Kimberly Kaiser, assistant professor of legal studies; and Georgianna Mann, assistant professor of nutrition and hospitality management, received funding to conduct research in Marks from May through August. Cafer and Mann, who have worked on a number of different initiatives related to health and nutrition in Marks, identified a need for more concrete data on how people are navigating their food environment, which has led to this particular project. All three faculty supervise students who routinely sign up for classes to be able to work on real-world problems. “We walked students through the research questions and design components, then worked with them to collect data in the Mississippi Delta,” said Cafer, principal investigator for the project. Kaiser and Mann are both co-principal investigators. Students working on the project were Sydney Mitchell, of Raymond; Payton Meadows, of Goldsboro, North Carolina; Cole Corek, of Senatobia; John Haynes, of Booneville; and Adam Cuff, of Mandeville, Louisiana. The partnership is making a positive impact on the community, said Judy Bland, executive director of the Marks Project. Mitchell, a biochemistry and Spanish major, said the work has been rewarding for her as well. Students interviewed parent-child pairs about their physical, spiritual and mental well-being and how their community supported it. They also discussed barriers present in their community to achieving well-being in each of these dimensions. After data collection, students analyzed results and wrote up their reports. The data will be used for three student publications and to apply for additional grant support through the National Science Foundation and Robert Wood Johnson Foundation. “The data will also be used in piloting a new method in the social sciences and a report being developed for community stakeholders, including a public meeting to be held for feedback and to help prioritize next steps,” Cafer said. Cafer’s proposal was one of two inaugural awards given by the UM Office of Research and Sponsored Programs for 2018 for Summer Undergraduate Research Group Grants. Program funding was provided by the Office of the Provost, with additional contributions coming from the College of Liberal Arts. The Summer Undergraduate Research Group Grants program has three goals: to encourage the submission of proposals for external grants that support undergraduate research projects; to allow faculty to gain experiences facilitating undergraduate research programs, experience that helps make external proposals more competitive; and to engage undergraduate students in research or creative scholarship.